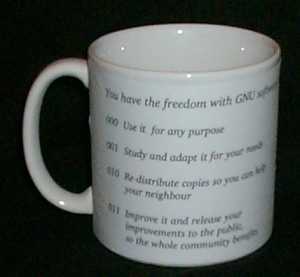 GNU Mug is designed to encourage thought and reflection on the philosophy of the GNU project, both at and away from the computer screen, whilst aiding support for the GNU project. 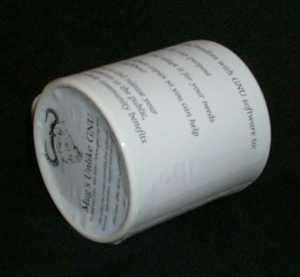 The GNU MUG project itself will result in the creation of hardware which is both practical and reliable, ideal for hackers who wish to concentrate on their programming without having to be regularly disturbed by the need for liquid refreshment. You may help this project by making new artwork and suggesting design improvements. The project will be ongoing. The first production run of GNU MUG will be version 1.0. The mug will be revised and re-designed over time so suggestions and artwork which you contribute can be rolled into future versions. Current artwork in the form of Open Office Draw files, and screen shots of the current design can be downloaded from the CVS repository. This project is part of the GNU project on Savannah. Bone china is a traditional, light weight, high strength material used in the manufacture of the highest quality drinking vessels. I have commissioned potteries in Staffordshire, England, home of famous potteries such as Josiah Wedgewood, to make mold designs and prepare for manufacture of the GNU mug. 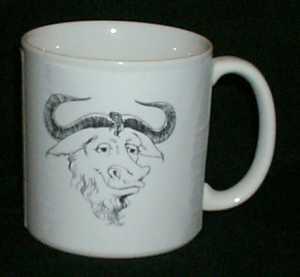 To fill demand until the final bone china GNU mug is available, we may need to run a limited number in the heavier earthenware material. Considering Bone China mugs often weigh half as much as earthenware or porcelain mugs, there are compelling financial reasons to opt for the more costly, higher quality bone china. The lower cost of air mailing a bone china mug will offset the increased cost of production whilst providing a higher quality finished article. The design should reflect the philosophy of the GNU project in few, thought provoking words. On the initial design, I have chosen to list the 4 basic freedoms for software to count as free. These have been re-worded for brevity. Please see the sources on CVS for the current version of the wording and overall design. Please use the savannah services or email me at audio-recordings@gnu.org with any ideas or ways you can help. How is MUG Unlike GNU? This project will differ from most parts of the GNU in several ways. The final usable result of the project will be a rivalrous resource. If you want to share this resource with a friend, you will be deprived whilst your friend is using it. The available source code will not, on it's own, be sufficient to compile a functioning version. Due to the nature of this project, the libraries this project is compiled against are not in the information domain. However, When technology is available to convert the libraries into a format for as easy and free replication on a free system, we shall do so. The final released result will not be easily modified or freely re-compiled due to the nature of the project. However, technology may, at some time change this situation. A fee will be charged by GNU for each instance of this project's result. (This will help raise funds for resources needed by the FSF and FSF-Europe). Until we have replication technology, we can pinpoint where each instance of the result of this project have come into existence. The relevant source code, to the greatest extent practicable, will be made available for general use under a copyleft-type license. The final result will be available from GNU. The project will be practical and reliable. The final result will enhance freedom. This project will take a light-hearted humorous approach. The final result may make people smile and think. Continues the GNU recursive acronym naming tradition into new fields. Community input will improve successive versions.